2 chambres, 1 salle de bain, 6-8 personnes. Pas de digue, accès direct à l'eau de la plage. Beaucoup de stationnement pour les jouets - Cottage a suffisamment de place pour beaucoup de camions et de remorques. Accès à l'eau - Le chalet a une plage privée. PAS de digue. Climatisation - Cottage dispose d'une unité de fenêtre et beaucoup d'ombre au-dessus chalet et le pont. Blanchisserie et fournitures - Cottage a laveuse et sécheuse, lave-vaisselle et tous les draps, ustensiles, tout ce dont vous pourriez avoir besoin. Nous sommes sur la plus grande partie du lac, avec une vue magnifique et des eaux peu profondes protégées par une plateforme de bain flottante. Quai privé pour attacher votre bateau. L'entrée de la dune se trouve directement de l'autre côté du lac. WIFI et télévision par câble inclus. Nous fournissons des oreillers, des serviettes et de la literie. Great place to stay, can't wait to come back next year! The house has great frontage on Upper Silver Lake. Nice sandy beach for the kids and a dock for fishing. Close to everything but far enough away that it's nice and peaceful. We would definitely stay here again! Neighbors were very friendly , overall a great weekend. It was very quiet till the Labor Day weekend's Friday. Still it was Ok when the neighbors (several cottages, mobile homes, named "Association") with kids from across the street started using their beach and the boat. There is no actual border in-between, so, they comfortably were crossing ours and fully the lake in the front. The water in the lake was too cold to swim in during second half of the stay. A lot of tall weeds start from the knee deep water level. We had nice bonfires at night, thanks to another neighbor's free dry firewood in abundance. 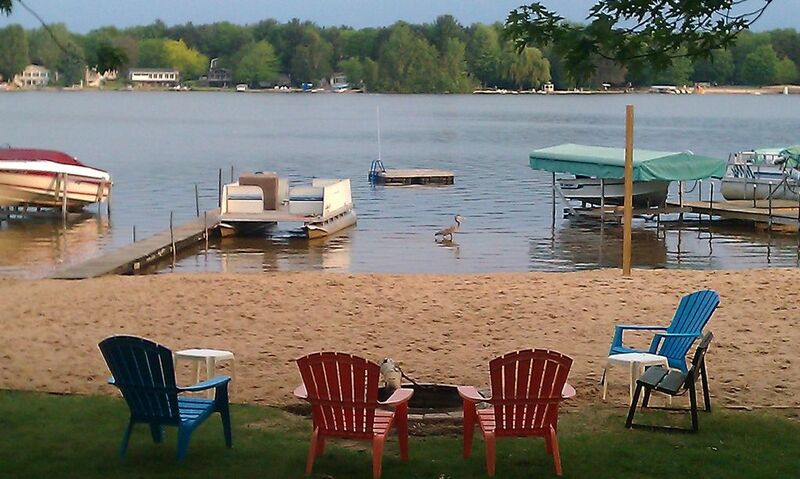 The cottage has a nice view on the lake and beach right from the living room. But the cottage furniture is all cheap and very uncomfortable: kitchen table and chairs, futons, and beds. Same is the bedding. Very small bathroom. But a big advantage was a second bathroom in the shed near the cottage. Mosquitoes were not a problem, more was tiny flying bugs in the cottage. Very annoying and once they touch you the skin becomes itchy. The main photo of the beach front is misleading - there is no that boat anymore. No issues with appliances, and utilities. Except at the very end of the stay there was power outage, and no water as a result either. We didn't like the check-in before 10am and check-out after 4pm requirements, that is unfair. Amy and her husband responded well to our calls about issues. Thank you, Amy. We would recommend this place, especially if the issues were solved. Regardless, we had a good time. Relaxing week for the family! For starters the owners were very responsive in answering our questions about what to expect when we arrived! There were no surprises and it exceeded our expectations. The cottage was very clean, with good bedding, and kitchen was well stocked with everything we needed. Gas Grill was full of gas and the Weber Charcoal Grill was perfect for a smoked pork shoulder. The parking area is HUGE so you can take your boats and sand toys and not wonder where you will park your stuff. The lake is peaceful and great fishing from the dock and around the lake. Nice sandy beach and sandy weed free swimming area. The water is warm and very clean - NOT clogged with weeds. Perfect size lake for skiing, tubing, and other water sports. Great place to make family memories, we are planning on coming back next year! Thanks John and Amy for a great vacation. Very peaceful lake and surroundings. Very localized to area attractions and shopping. Sand dunes were only 5 minutes away. Our group had a great time and already talking about coming back next year. Our main goal, with two small boys (7 and 4) was to find something close to the beach. You can't get closer than this! While our little one napped, our older one was fishing off the swimming dock. No packing up supplies, driving around, loading up the car to enjoy the beach. We just opened the back door. The unit had everything we needed for our 5 day stay including firewood and propane. My husband and I built a fire every night on the beach and sat by the fire as the kids slept inside. This was the ultimate in relaxation. There were other things to do close by - the kids loved blueberry picking, Mac Dune Rides, Whippy dip - but when asked what they liked the best - they said going out on the little pontoon boat and fishing with Daddy was their favorite. On our last day we were already trying to figure out how we can get back again next year. Thanks Amy, for some amazing family time. Directement sur Upper Silver Lake avec façade privée. association supplémentaire façade côté également pour votre usage. entrée des dunes de sable est directement sur le lac. NO Seawall belle plage de sable fin. Our rentals are weekly, Friday to Friday. Check in at 5 pm and check out at 10 am. We allow a MAXIMUM of 10 people sleeping at night (this would be using futons). We allow a MAXIMUM of 12 people during the day 9am-10pm. If guests exceed these numbers, the security deposit will be kept and extra guests will be escorted off.